I was recently offered a 10% discount by a contractor for paying in advance. Of course, this raised warning flags for me. Believe it or not, this has a connection to the current trouble with Nortel’s pension plan. Ordinarily, I wouldn’t consider paying a contractor in advance for fear that he would just skip off with the money. In this case, it was a contractor I’ve used and trusted for about a decade now. I went for the deal with only mild misgivings. In the end, my contractor didn’t skip out on me, but he also didn’t give me quite the same service as he had in the past. The work was done a little later than usual, and I had to place a couple of extra phone calls to be the squeaky wheel that gets the grease. In the end, I’d say that the 10% discount wasn’t quite worth the extra trouble. This is often the way things go with an agreement between two parties where one side fulfills their obligations first. The other side may renege entirely, but much more often they just change the deal slightly. The delivered goods or service may not be quite up to the promised standard or may be delivered late. This is what is happening to current and former Nortel employees now. A percentage of the work done by Nortel employees was paid for with a promise of a pension when they retire. Nortel has already benefited from this work, and now they are changing the deal by reducing the promised pensions for at least some of the employees. Laid off Nortel workers who choose to withdraw the current value of their pensions are now being told that they will only get 69% of the originally promised amount. There isn’t much that can be done about this. If there are only 20 cookies on a plate and ten people are owed three cookies each, something has to give. The battles over Nortel’s pension and assets will continue until nothing is left. When all the assets are gone, there will be plenty of people left still owed money. In the past Bell has made me numerous offers for internet service that doesn’t work at my house. Their latest offer of a long distance plan is equally enticing. Apparently, the Canada Block of Time Long Distance Plan is only $17.95 per month. Just before this price is the word “from” written sideways in small letters. There is also a tiny “1” indicating the footnote on the back of the letter that informs me in ultra-small font that taxes and a $5.95 per month network charge are extra. The letter says that this “long distance plan matches your unique calling habits and saves you money.” It’s hard to see how this could be true given that in a typical month my family uses about $4 in long distance. This reminds me of the time when a life insurance salesman promised to save me money, but then proceeded to offer me plans that all cost more than double what I was already paying. I guess the target market is people who look at two numbers and can’t figure out which is bigger. The basic idea behind leveraged ETFs seems appealing. These ETFs seek to go up or down double or triple the amount of a given index. Since stocks tend to go up over time, you’d think that doubling or tripling this gain would be a good idea. Unfortunately, volatility punishes leveraged ETFs and some of these ETFs seem to have unexplained leaks. Many investors believe that if an index rises 10% one year, then a double-leveraged ETF will rise 20%, and a triple-leveraged ETF will rise 30%. If you think this is true, you need to slow down and understand where this reasoning goes wrong. As Thicken My Wallet explains, these ETFs get rebalanced daily and this changes everything. The leveraged ETFs magnify volatility, and this compounded volatility punishes returns. All this analysis has been based on the “bull” ETFs. 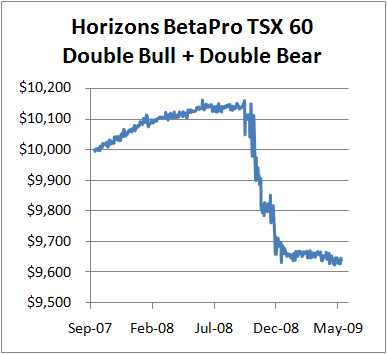 There are also “bear” ETFs that seek to get the opposite return of the index. So, if the index goes down 1% one day, a double-leveraged bear ETF would go up about 2%. These returns have excluded all trading fees, MERs, and any other expenses. Is this volatility problem the only drain on leveraged ETF returns? I decided to try an experiment where a pot of money is invested 50/50 between the bull and bear versions of the same ETF. With daily rebalancing, this should eliminate the volatility problem. 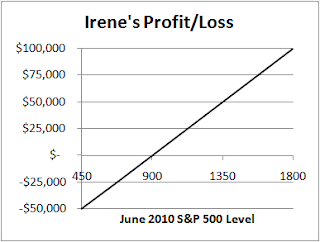 The gain in one ETF should cancel the loss in the other each day leaving just expenses. Of course, it makes no sense for an investor to actually do this. 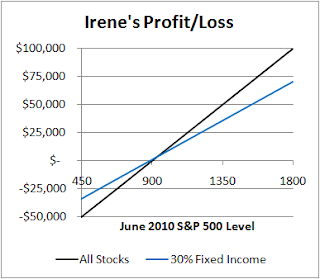 The goal of this experiment is to eliminate volatility losses and see what happens. My analysis ignores the trading fees that would result from the daily rebalancing because I want to examine the nature of these ETFs. 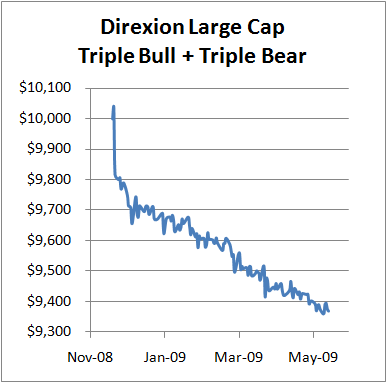 The first ETFs that I tried this on were the Direxion US Large Cap triple bull and bear. The following chart shows what would have happened to $10,000 split between these ETFs since their inception. If we ignore the initial big drop, these ETFs seem to be leaking money at a consistent rate of about 9% per year. This far exceeds the advertised expenses of about 1%. The bull ETF also paid out a couple of small dividends, but this falls far short of explaining the leak. Perhaps, the trend in the chart is only short-term and will change. In the end, I have no explanation for this drop. It’s hard to see any particular trend in this data. The overall drop of about 3.5% in 20 months exceeds the advertised yearly MER of 1.15%. The inconsistency of results seems to indicate that the ETFs do not track the index exactly as intended, but it’s hard to tell. Between the volatility penalty and the unexplained leaking of money when volatility is factored out, these ETFs won’t be part of my portfolio. The Ontario budget announced plans to change the sales tax structure on new homes. The way the harmonized sales tax will be applied starting in mid-2010 will create some perverse incentives that are likely to result in a cycle of tax avoidance and modified regulations. Under the new plan, all new homes will be taxed at the HST rate of 13%, but those selling for less than $400,000 will get a 6% rebate. New homes selling for more than $500,000 will get no rebate. The rebate gradually fades away between these two prices. A common reaction to all this “good – let the rich people who can afford big houses pay.” Even if you think this way, consider that if these thresholds remain the same in the future, inflation will eventually push the price of even modest new homes past these thresholds. Inflation will create a hidden tax increase each year. The sales tax on a $400,000 home will be $28,000, and the sales tax on a $500,000 home will be $65,000. This means that the marginal tax rate will be 7% up to $400,000, but on the next $100,000 it will be 37%! After $500,000 the marginal rate drops to 13%. The huge tax rate of 37% from $400,000 to $500,000 will create a strong incentive to avoid taxes. We’ve already heard of strategies of builders selling homes before they are finished and leaving it to the home owner to complete the job. Another possible strategy might be to sell a house on a minimal piece of land and sell the rest of the land in a separate transaction. No doubt the housing industry will find many more creative ways than this to avoid the ultra-high sales tax rate. This isn’t intended as an indictment of the housing industry. Almost all of us try to avoid high taxes. These tax avoidance efforts will force the government to close loopholes, and the cycle will go back and forth. All this effort will be driven by bad tax policy. A curious side effect of the tax rules amounts to social policy. House builders are now discouraged from building homes that would sell for more than $400,000. If they must go over this threshold, they might as well go way over and go after the high end of the market. We can expect the $400,000 to $600,000 range to be a little thin. One potential fix is to give all new home buyers a 6% rebate up to $400,000. This would give a fixed rebate of $24,000 on high end homes, and the marginal tax rate would not exceed 13%. Another possibility is to reduce the rebate over a wider range of prices, say from $400,000 to $800,000 (instead of only $500,000). In this case, the marginal sales tax rate never goes over 19%. Punitive marginal tax rates are bad tax policy that create strange incentives and foster tax avoidance. Governments need to make tax rate structures smooth. If you ever watch come-ons for trading systems you’ll find that they are a lot alike. “It’s possible to make money in any type of market, whether stocks are going up, down, or staying the same.” They promise to teach you how to make money, but there is a catch. It’s true that you can make money in any type of market. If a stock is going up, you can profit by buying a call option. 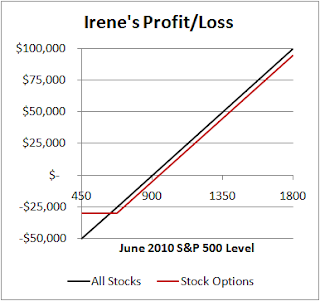 If the stock is going down, you can profit by buying a put option. 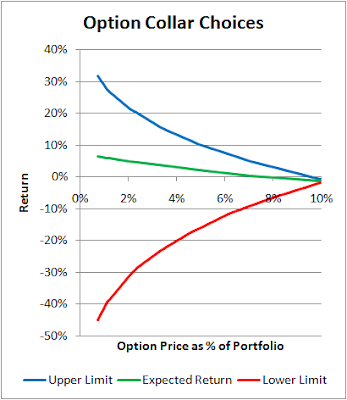 If the stock is going to stay steady, you can profit by selling both call and put options. The unstated catch in all this is what if you are wrong? The answer is that you’ll lose money. If the companies behind these come-ons really could predict stock price movements, they would use their systems to make money rather than waste time teaching you how to do it. These companies profit from your activity. You pay fees to them for their software and platforms and for teaching you, and they may get part of the trading fees you pay. They make money even if you lose money. They are exploiting your sense of confidence in predicting the future of stock prices. Historical data show that stock market indexes grow faster than the economy as measured by Gross Domestic Product (GDP). On the surface this seems impossible. The stock market is part of the economy, and while it may grow faster than the economy for short periods, it makes no sense that it could outperform GDP over the long term, but this is what seems to happen. According to data from Angus Maddison, from 1926 to 2000, Canadian GDP per person grew by a factor of 5 above inflation. Because the population grew as well, overall GDP rose by a factor of 16 above inflation. The US had a similar experience with per person GDP rising 4.3 times, and overall GDP rising just 10.3 times. However, according to Ibbotson and Associates, over this same period of time (1926 to 2000), large stocks with reinvested dividends rose by about a factor of 300 above inflation, and small stocks rose by a factor of 700 above inflation! This means that large stocks outgrew US GDP by about 4.7% per year, and small stocks outgrew GDP by about 5.9% per year. This sustained outperformance by stock indexes over GDP growth seems impossible. So, how could it be? The short answer is that GDP is real and stock indexes are not. Extremely little money was placed in stocks indexes in 1926 and left there until 2000. Every dollar invested in large stocks in 1926 would have grown to about $3000 in 2000 (but only worth about one-tenth as much due to inflation), but very little money actually sat in the index untouched that long. There is a connection between this apparent paradox and Canadian Capitalist’s discussion of the DALBAR study. “While the S&P 500 has returned 8.35% over a 20 year period ending in 2008, the average equity investor earned just 1.87%.” The 1.87% return is real, and the 8.35% return is a mostly imaginary figure earned by only a small minority of investors who bought and held stocks for 20 years. It is ironic that stock index returns are easily accessible by buying and holding index ETFs, and yet the majority of investors will underperform the index. How do stock indexes outperform the average investor? Those responsible for choosing the stocks that make up the index do a better job than the average investor. Typical investors fail at market timing efforts and put large portions of their money into inferior investments like bonds and cash. The theoretical money in stock indexes stays there and is occasionally moved from one stock to another as the stocks making up the index are changed. Apparently those who make the decisions about which stocks should be in the index do a good job at stock picking. 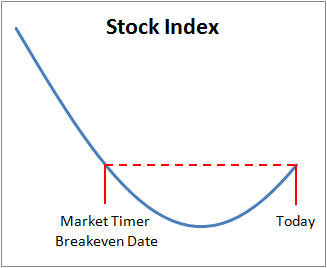 Another interesting part of this paradox is that if a significant number of investors suddenly bought into the index and left their money there for an extended period of time, stock indexes would cease to outperform the general economy because stock index returns would become real for a large proportion of wealth. It is the very fact that few people take advantage of the power of the index that makes it such a good investment. In his 2007 letter to shareholders, Warren Buffett ridiculed those who project the Dow Jones Industrial Average (DJIA) to increase by 5.3% to 8% per year because this means that the DJIA will reach 2,000,000 to 24,000,000 by 2100. The implication is that these large figures are clearly impossible. But, unless investor patterns change, the DJIA will continue to be just theoretical and not represent real money because few people will buy the DJIA and forget the money for 100 years. If investors continue to underperform the DJIA, it would easily reach crazy-looking heights. 1. Companies who make overly-rosy predictions of returns on pension funds to justify underfunding pension plans. 2. Financial advisors who sell potential clients with overly-rosy predictions. These two groups deserve criticism. The rosy predictions are impossible because they are based on growing real money. While the DJIA could reach into the millions by 2100, the bulk of real investment dollars cannot. We tend to think of index investors as those who are satisfied with being average. But, buy-and-hold index investors are a small minority who, on average, have outperformed the average investor by a wide margin. Most investors who are stock pickers have had the feeling at one time or another that a particular stock would go down. The usual response to this is to sell any shares they have or not buy shares. Some are tempted to short the stock, but this is a difficult game. Shorting a stock means to sell shares that you don’t own. You are essentially borrowing shares from someone else and selling them with the promise that you’ll buy the shares back later and return them to the original owner. This is done with the hope that the shares will drop in value between selling them and re-buying them so that you’ll make a profit. Unfortunately for short sellers, stocks tend to go up. Suppose that the stock market tends to go up 10% each year. So, investors in low-cost stock index ETFs make 10% per year, on average, without doing anything. To beat the index as a short seller, you have to find a stock that will go down by about 10% or more. If a short seller just throws darts at a stock listing, he can expect to lose about 10% each year, on average. If he is so clever that he is able to pick stocks that perform 20% worse than average (so that they drop by 10%), his reward is that his investment returns will roughly match those of the know-nothing index investor. Short sellers are like runners in a downhill race who choose to run uphill from finish back to start. Taking on added challenges is sometimes admirable, but don’t expect to win any races. The book Luck of the Draw: True-Life Tales of Lottery Winners & Losers by Chris Gudgeon and Barbara Stewart is a fun read, but it contains some very bad financial advice. This book is packed with funny and strange stories about lottery winners, but it may not be very good for the financial health of people inclined to buy lottery tickets. One unavoidable problem with a book like this is that reading about a new lottery winner on each page creates the impression that winning the lottery is common. It is exceedingly rare. You won’t win the lottery. Many of the stories discussed whether or not the winners would quit their jobs, even with modest-sized wins like a few hundred thousand dollars. This is not enough to retire on. Perhaps $2 million would be enough if the winner invests wisely and lives a middle class lifestyle without excessive spending. But how likely is that? Winners tend to splurge with plenty of help from family and friends. 1. Move somewhere like the Bahamas where taxes are lower. So, now that you have a lot of money, you should leave family and friends to save money? I’d rather stick with doing things that make me happy. If you’ve always wanted to move, go for it, but moving just for tax reasons is crazy. 2. Divide your win among family and friends so that investment returns will be taxed in lower tax brackets. So, if you win money, you should give it all away so that you won’t be rich and won’t have to pay so much tax. I can see where your family and friends might like this one. 3. Go crazy and spend all the money fast to avoid paying tax on investment returns. Great idea. You should lick metal poles in the winter, too. I have my own idea. Take the money you were planning to spend on lottery tickets and put it in a savings account. Each year put the money into a low cost index fund. After 25 years, look at the account balance in the fund. You’ll find that it looks like a modest-sized lottery win.